Regatta fleece jacket range from Outdoor Look. Buy discounted Regatta fleece jackets online today. 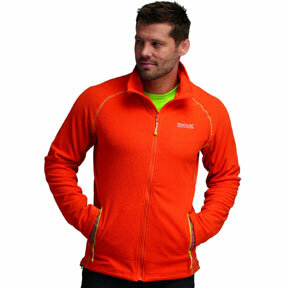 A Regatta fleece makes ideal outdoor clothing either worn alone or layered. The gamut of Regatta fleeces that are available to choose from is second to none and all are soft to the touch and are the essential piece of kit for anyone who undertakes any outdoor pursuit, from walking to cycling to mountaineering and anything in between. The Regatta Thor fleece Jacket is one of our best sellers, a full-length supa-zip fleece with big deep pockets, a high cosy collar and a price that is one of the competitive around. The Regatta Ladies Cathie Symmetry Fleece Jacket offers a large range of more feminine colours but with the same durable features offered across the Regatta fleeces range, featuring an adjustable shockcord hem and two zipped lower pockets as well as the anti-pill feature. In tandem with our amazing customer service, free delivery options and a comprehensive catalogue and website to choose from, featuring major brands at competitive prices.